When I was little, my Mom used to sing that when she was getting ready on Easter morning. We dressed up, Easter bonnets included, and had brunch at my Grandmom's where I'd get my picture taken outside every year, weather permitting. People always arrived bearing pots of tulips, hydrangeas, and daffodils wrapped in bright crinkly paper. Strawberries and quiche were both always on the table. In the afternoon, we went to Aunt Jake's bearing more flowers and had an egg hunt in her awesome garden. Ham, devilled eggs, and very sweet iced tea were always on the menu. As the years went on, I stopped dressing up. My Grandmom eventually stopped hosting Easter brunch and we stopped going to Aunt Jake's for dinner. All traditions change at some point. I have fond memories of the old traditions, but we must make room for new. This is our second year spending Easter at the shore, and I plan to do that for eternity...or until it's time to change tradition again. I might spend the day differently, but I still always buy a hydrangea and plant it. My table always has strawberries on it. And this year my Easter bonnet will be a baseball hat to shield my face from the sun on the beach. we go to the inlaws for easter where the kids go crazy during the easter egg hunt and we battle it out at the dinner table with the easter eggs....it's a romanian tradition (i think??) where everyone selects and egg and go around knocking other people's eggs...if yours cracks, you lose. When I was growing up, well really until I left MN at the age of 23, Easter would always rotate. One year we would spend it with my dad's side of the family & the next would be with my mom's side of the family. The first 3 years I lived in TX my friend would fly down to Houston to see me & we would do whatever Friday/Saturday & then spend actual Easter on the beach in Galveston. I couldn't tell you what I did last year when I first moved to Ft. Worth, nothing? I like spending Easter on the beach. I'm going back down this year but will be spending actual Easter cleaning my apartment & getting ready for the work week. 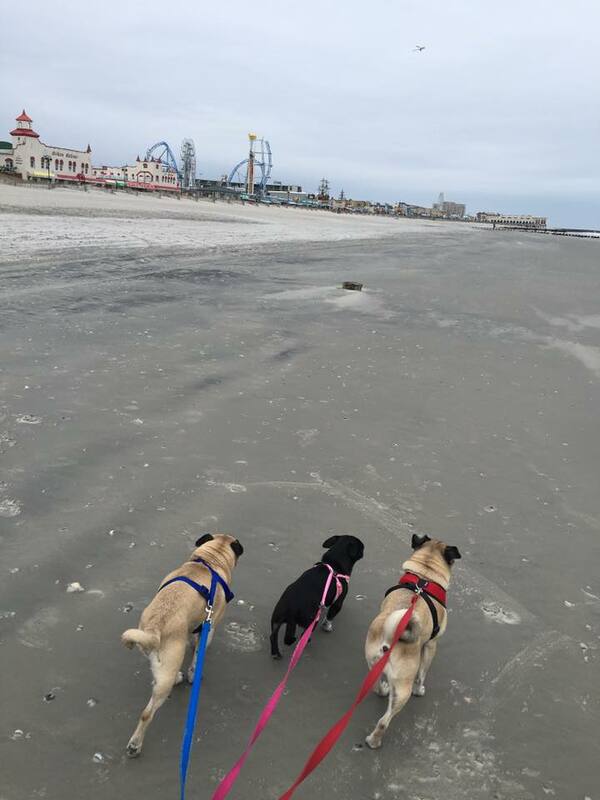 Enjoy the shore! I hope you have a fabulous Easter! Oh. My. Lord. That bonnet. That whole pink get up. I'm in love! Beyond grateful and blessed to be spending the holiday with you guys in OCNJ. So that dress I had on holding you in that picture- I was wearing that for another occasion when you weren't with me and someone told me I looked so pretty PREGNANT!?! Jmj. I said I had my baby a month ago. Lol lol. Hoppy Easter or spring holiday to all. I love your memories! 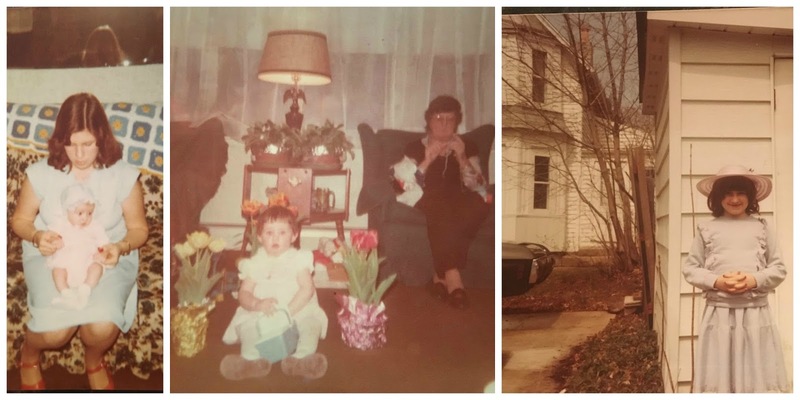 As a child, we always went to Dad's family in Germantown for Easter. Nowadays? Whatever floats our boat. This year, son & gf invited us with her family, poolside. Daughter's bf's driving 3 hrs. to join us for the weekend. Church, ham dinner, Lo Country Boil at the pool & family. Happy Easter! A baseball hat totally works for a perfect Easter bonnet on the beach. Pictures outside...definitely one of my childhood Easter memories! We're going out for Easter brunch, which is a new thing, but I'm happy to make that a new tradition. We're definitely in a phase in our family now where we've bucked tradition and do new things each holiday, which, since we don't have kids, works. Saturday night, I'm cooking at home for my Dad's bday and people are coming over to share dessert with us, and on Sunday, we're going out for early Easter dinner with Shawn and his Mom. You're right traditions change as you go through the different stages of life but as a child I think your family had a nice tradition of brunch and bonnets. I'm with ya on getting away to the shore/beach or wherever. I hope you enjoy and get lots of relaxing in. Happy Easter weekend! It is so fun looking back at pictures when we were little and think about old traditions. We used to go to church and have lunch with my grandmother on Easter until we moved away. I am hoping to create some fun traditions with Zoe! I hope you enjoy your time at the shore. I cant think of a more fabulous place to be then next to the ocean. I love the old photos! 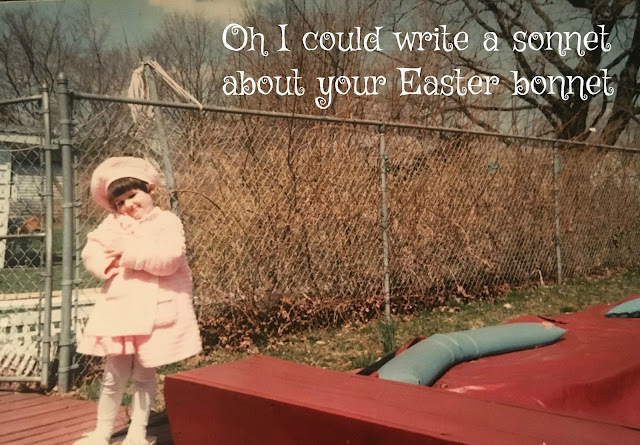 Easter was pretty low-key when I was a kid. We did egg hunts and dyed eggs but I was always jealous that my friends got the whole Easter basket gifts and chocolate and new outfit thing. Now of course I'm like - Good for you Mom on resisting the consumer pressure! This year Easter is also my MIL's b-day so big family brunch. Going to attempt dying eggs for the first time with the kids too - Wish me luck! I love that picture of the pugs! Have a nice Easter. We either go all out for Easter or do nothing. This year nothing and I am trying to be okay with that fact. Sunday will be my last day of Spring Break and I have had wacky vertigo since Tuesday which I think is because of my ears so I think doing Nothing will be okay. I love the picture of adolescent you. It sums up those years. We haven't spent an Easter together since...2014? But I was reminded that I always make chicken cordon bleu on Easter so we'll be doing that! That sounds like a wonderful new Easter tradition! We used to celebrate all holidays at my grandma's, but in the last few years my mom has started hosting Easter. The year after K and I got married his mom remodeled their house and we took Easter. So now my mom does lunch, we do dinner for K's family, and then we head to his grandma's for dessert :) It's a busy day! Ha! I enjoy reading about others family traditions ~ the old and the new. Those older pictures are fantastic. :) I'm a big fan of your new tradition right now. :) I'm on a plane... so no big Easter plans here today. Just getting home and getting ready for another 10 days of travel... yikes! Spending Easter at the shore every year sounds like a great tradition to me! We always had a low-key Easter celebration with my grandma and cousins. Now it's all about the next generation, which is even more fun for me. We have a big brunch at my parents' house and big dinner with Jacob's family.